Fully automatic curve, surface and volume mesh generation. Load and boundary condition management and visualization. 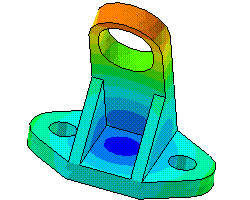 Compute finite element shape and distortion parameters. Visualize all finite element types, polyhedral cells, gaps, welds, MPC's, coordinate systems, ...everything. 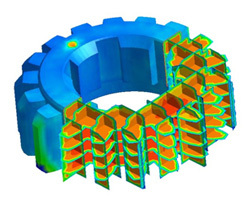 Modern, high performance finite element formulations for solid, shell and beam elements. 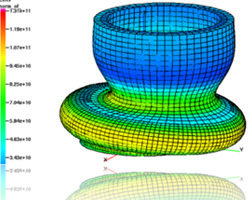 Element independent corotational formulation for large displacements and rotations. Material models ranging from linear isotropic and orthotropic to plastic and hyperelastic. 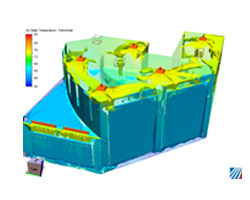 Both structural and heat transfer analysis supported. Large scale sparse matrix solver and block Lanczos eigensolver. Export solution results to standard results file formats. Contact us for our results on standard industry tests such as the MacNeal-Harder problems and the Raasch Hook. Isosurface computation, cutting planes, clipping and capping. Streamline generation, vector field topology extraction. Discrete scalar, vector and tensor markers. Complete annotation, stroked text, coordinate system triads, color legends, graph axes. Data structures for model and results probing. 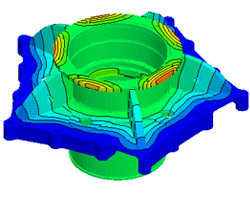 VKI develops and supports DevTools, a suite of component software development toolkits for computer aided engineering (CAE) applications.DevTools is used by many of the CAE industry's largest and most respected software companies worldwide to deliver applications for structural analysis, heat transfer, computational fluid dynamics and electromagnetics. 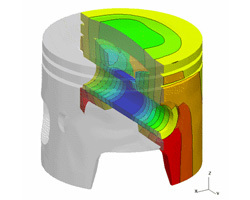 DevTools is unique for the CAE industry, providing component development toolkits to enable application developers to build integrated, customized, low-cost, end-to-end CAE analysis systems: from mesh generation and pre-processing through solution to post-processing and visualization. Licensing Component Software allows your application developers to focus their efforts on your core competence and differentiation from your competitors. DevTools evaluations are available for free for a 90 day period. Note that Devtools components are a software development tool, not an end user product. VKI releases DevTools 4.4.6 with significant enhancements in all toolkit products.